LoL esports: intense, old-fashioned fun. You’re not a fan of League until you’ve experienced the excitement of LoL esports. If you’re a League junkie, chances are that you’ve watched at least a pro game or two. So the real question is this: Have you watched the games that really matter? Here are ten of the most famous (or perhaps infamous) games and matches that every LoL esports fan should watch – and if you haven’t seen some of these yet, go to your favorite League streaming website and check them out! Watch the game on YouTube. Possibly one of the strangest and most entertaining games I’ve ever watched – we’ve got a Heimerdinger jungle on GSG, and they still manage to win the game in 21 minutes. It’s definitely worth a watch, if you’ve got time. While this game isn’t necessarily chock-full of brilliant outplays and kills and baiting, the back-and-forth dynamic certainly makes it fun to watch. It looked like EDG would have a pretty easy win, focusing heavily on their siege composition and not as much on kills…. but then to everyone’s surprise, AHQ turned the tide by winning some nail-biting teamfights. AHQ’s mid, Westdoor, looks like he’s about to turn around and give you a piece of his mind. I feel a little bad for Dark Passage, because they destroyed during the Wildcard Tournament and made it to Worlds undefeated, and then promptly went on to lose every single game they played during the group stages. Meanwhile, in this game, Samsung White’s ADC Imp carried out the first pentakill of the 2014 championships, causing Dark Passage to surrender almost immediately afterwards. A rather embarrassing defeat for them, but at least it’s a great game for viewers like us. The final weekend of Season 3’s summer split led to an extremely hyped-up five-game series between telecom rival teams SKT and KT – with the legendary Faker on one side and the talented Insec on the other, what would the outcome of this matchup be? 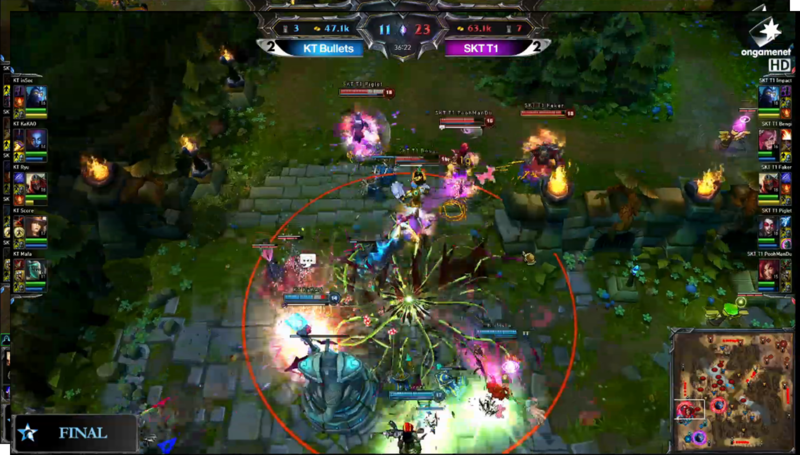 SKT and KT definitely didn’t disappoint, dueling it out all the way until the fifth and final blind-pick game. 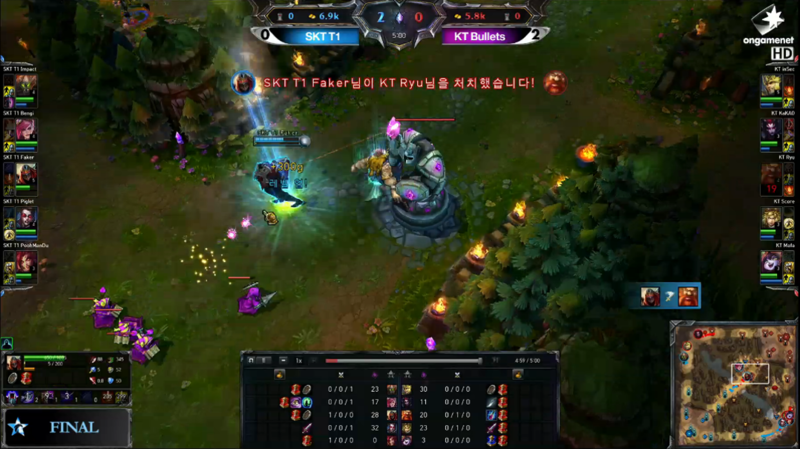 Faker gets first lane blood on Ryu in a down-to-earth solokill. …Which wasn’t shabby at all, with a level one skirmish leading up to even more team fights, which finally resulted in SKT’s final win. An excellent turn of events either way, if you ask me. SKT goes for a push in top lane after they get Baron. This season 3 game had high stakes: not only was it a matchup between age-old rivals Fnatic and SK Gaming, but it was also the deciding factor in determining which team would advance the group. With Fnatic at a gold disadvantage most of the game and SKG grabbing two almost-free dragons as well as the first baron, the game didn’t look too good for Fnatic. 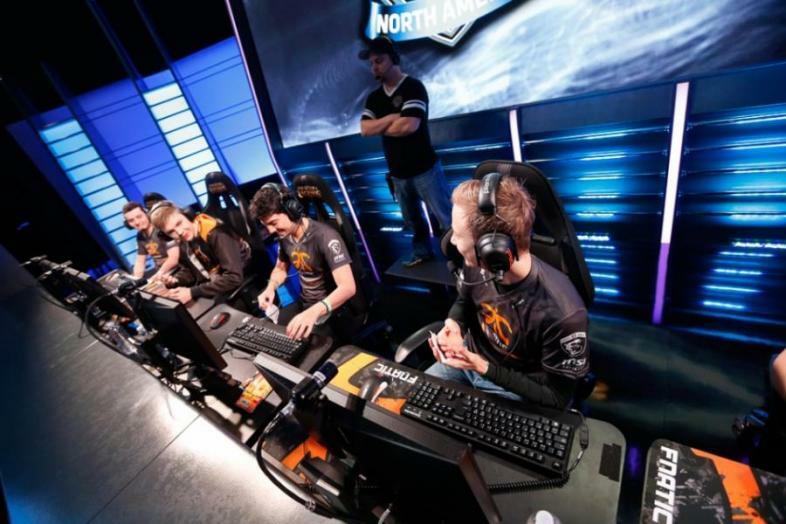 But then at 48 minutes Fnatic had the gold advantage for the first time during the entire game, and after some more back-and-forth between the two teams all but one Fnatic’s members died – so SKG went for Fnatic’s base, but what they didn’t count on was xPeke’s phenomenal backdoor play… And by the time SKG noticed that xPeke’s Kassadin was chomping down on their Nexus, it was too late. This was one of the most intense games I’ve ever watched, with Fnatic squeaking out their final victory (Kassadin had 39 health left when the Nexus was destroyed and Olaf was already in the middle of an auto-attack animation) at quite literally the very last second. Watch Game 3 on YouTube. Basically a wild ride from start to finish: this is another five-game series, pitting, of course, the top teams from Europe and Korea against each other. Fnatic’s Febiven contemplates his next strategy as he stares off into space. If you choose to watch all five games (it’s worth it, trust me), take a look at how much these games revolve around Rek’Sai – especially in Game 1 and Game 3, when Bengi and then Reignover, respectively, play the champion. If you choose to watch only one game, though, watch Game 5. Let your eyes widen and your jaw drop as Fnatic gets a grand total of zero turrets and falls against the might of Bengi’s Nunu plays (to be fair, though, Nunu is rarely played in Europe, so we can forgive Fnatic a little). These are the games that made InSec famous for his Lee Sin kick, the move that’s now simply called “the InSec.” Korea dismantled Europe both efficiently and ruthlessly in the two games they played, winning 2-0 and moving on in the tournament – and InSec was a huge part of this effort. InSec, looking particularly focused on whatever amazing play he’s concocting in his brain. Whether he was initiating fights or offering Yellowpete to his team or blowing Alex Ich’s Kennen far, far away from his teammates, InSec beautifully showcased his talents as Lee Sin. Widely considered to be one of the stronger teams at worlds last year, Alliance defeated Korea’s number 3 seed Najin White Shield with a perfect game (zero deaths, zero towers lost) and began looking forward to a spot in the quarterfinals. Meanwhile, Kabum Esports were losing rather horribly in all of their initial matches, but they were slowly improving. On the last day of their group stage, Kabum was set to play against Alliance and, well, it didn’t go so badly. Kabum, elated at their outstandingly beautiful victory. They focused heavily on objective control, and, long story short, they pulled off a stunning victory against Europe’s favorite team. Which is impressive enough on its own, but this win is also widely regarded as the first time that an International Wildcard team has ever won a game in the world championships. As these two top-tier teams duked it out for the gold, the final series of this year’s MSI led to an intense five-game duel of talent and passion. EDG’s PawN had some lackluster plays in the first two games of the series, contributing to EDG’s demise against SKT’s aggressive playstyle in the first game and a rather nerve-wracking second game that they eventually won. But they stepped up their game (pun very much intended) for Game 3, putting Clearlove on Nunu and letting him snowball all the way to their victory (also, Meiko’s Annie plays were on point). Faker wouldn’t let SKT go down that easily, though, leading SKT to a 2-2 tie by punishing every small mistake on EDG’s part. Faker carried SKT to tie 2-2 with EDG, forcing a fifth and final game in the series. As for the fifth and final game, it was exciting and wonderfully suspenseful from start to finish – Faker ended up picking Leblanc, which looked like a bad sign for EDG. But EDG’s strong early game allowed them to take the lead early, complete with deep warding and tower dives. Faker certainly tried his best playing his fearsome main Leblanc, but unfortunately it was not enough to stop PawN’s nearly-perfect hitrate with Morgana’s Dark Binding and Meiko’s beautiful peel and engage tactics. So there we have it – the first ever MSI champions, EDG, taking home the gold by ending with a bang. 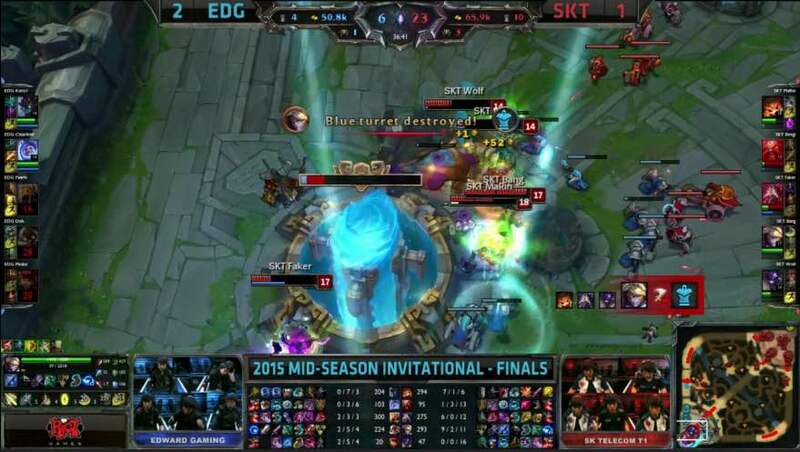 EDG, the MSI champions… What a match, kids, what a match. The “God-slayer” isn’t slaying God… That’s just a computer screen…. Oh wait. This is the infamous game that made the “God-slayer” famous: within the first ten minutes of the first game of the semifinal series for the 2013 WCG Korean qualifiers, something practically impossible happened. As Nidalee, PawN solokilled Faker’s most-played champion, Orianna, a jaw-dropping total of three times. Which is reason enough to put this game on the must-watch list of every LoL esports fan. This is Faker, the one name every League player grows up knowing. Not to mention that once Samsung Blue took the WCG Korea semifinal series 2-0, it was Faker’s second time ever being eliminated from a major tournament… and this is the Season 3 world champions we’re talking about. A brilliantly-played game, if you ask me. Pop your eyes back into their sockets, and take a deep breath. The excitement that is professional League is definitely contagious – grab a friend or two and watch the games, and then talk to them about all the excellent plays and mind-blowing kills that every single one of these matches showcases. If you want to take a break, though, why don’t you go take a look at ways you can improve your game or think about the very serious question of which teams are the best in the world? The action in this game will keep you on the edge of your seat.